I just recently bought my first laptop yesterday. I didn’t have a big budget and I wanted to keep it under $700. To get to the point I ended up with an Asus. Probably not one of the best known brands out there Asus still delivers good quality for an affordable price. 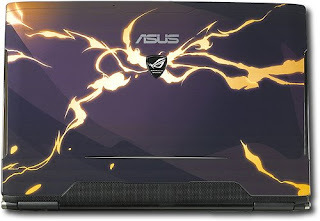 While browsing the internet and Best Buy displays I came across a new Asus Laptop whose look captured my attention first. The Asus G50Vt-X5 comes with a wide range of features at a price that doesn’t burn a huge whole in your wallet. The G50Vt-X5 comes with Intel Centrino 2 processor technology with interrelated Intel Core 2 Duo Processor P7450 Intel PM45 chipset, 802.11a/b/g/n network connection and extended battery life capability to let you work better, faster, and longer. If you need to multi-task then the G50Vt-X5 is perfect for you. It comes with 4GB PC2-6400 DDR2 memory with a 1066MHz frontside bus, a 3MB L2 cache and 2.13 GHz processor speed giving you blazing fast speed to handel multiple projetcs simultaneously, the Asus also comes with a 320MB SATA hardrive(7200 rpm) for more than enough storage with faster read/write times. If you like recording movies and what not then you will be pleased to know that the Asus G50Vt-X5 comes with a Multiformat DVD RW /CD-RW drive with double layer support that records up to 8.5GB of data or 4 hours of video using compatible media, it also supports LightScribe direct disc labels using compatible LightScribe media. All that is made even better by the 15.6″ WXGA widescreen display with a 1366×768 resolution that brings your games and movies to life! It also features a secondary OLED display that gives you notifications of instant messages or e-mails while playing a game. Speaking of games, the Asus is definatley equipped for some gaming. Now while it isn’t an Alienware, the G50Vt-X5 comes with the NVIDIA GeForce 9800M GS graphics card with 512MB of dedicated GDDR 3 graphics memory for a powerful graphics performance and an Azalia audio chip with built-in Altec Lansing stereo speakers and an HDMI output for an intense gaming experience. Some other features include a built-in 1.3 megapixle webcam, facial recognition software, an 8-in-1 media reader, 1 IEEE 1394 port and 4 high-speed USB 2.0 ports, built-in 10Base-T/100Base-TX Ethernet LAN with RJ-45 connector, built-in gaming sidelights with color-coded keys for gaming, and Microsoft Windows Vista Home Premium Edition 64-bit operating system. You get all this and more for the modest price of $999. Overall this computer is great for basically anything you would need. Coming from someone who now has an Asus and loves it, this laptop is definatley worth looking into. Special thanks to our sponsor for supporting this laptop blog and making it possible. Please support them by visiting their Laptop Rental website. Heres a giant 13 page forum discussion on your new laptop thought you might want to check it out. I’m really happy with this, I crashed Vista a few times and downgraded but after a few weeks of XP it hasn’t crashed. Vista 64 was nice but it’s nice to have XP again. The ASUS forums have threads on downgrading. You can also play with the LED in LCDHype in XP. I pretty much gamed this thing in right away and was very happy to see Mass Effect maxed out and very playable. Turning VSync off is a thing of the past. Turn that stuff on! LOL. I had to make a custom profile for Test Drive Unlimited and Need For Speed Undercover so that I could run more buffers, AA, VSync, etc; through the NVidia contorl panel. Because once you see what this can do, it’s hard to go back to older games that don’t have all the graphical options. After all the excitement wares off, this is still a very comfortable laptop to use, Express Gate works with XP also so you always have that option if you are waiting and can’t plug in somewhere. It’s a solid machine that should last. Don’t go overclocking and playing around because it isn’t needed. The speakers however are very very cheap. I don’t know what they were thinking. I didn’t realize this because I plugged into desktop speakers, but when I’m on the road I wonder if I can watch a movie while idling the truck and still hear it. My budget Compaq from two years ago has much better speakers. But for under $1000 this is the least of my problems. You can get a $10 pair of speakers if you need to or even get an FM tranmitter so that it will send the sound to an FM radio channel then you can use your stereo speakers (this is a blast when you live in a truck with a good stereo and play games or watch movies). It looks cool, and may be what caught my eye and made me buy it but I could live with a less eye catching madel so someone doesn’t want to steal it. greg where is the link for the Asus forum, I can’t find it to downgrade my vista 64 to xp in the right mode. This is my first laptop. I wanted something that was fast and would hold it's own against any comparably priced model. Asus ROCKS!!! Their customer support is fantastic! Gaming performance is great with Direct X 9. Direct X 10 is a little slow however. I will stick with Asus in the future. The only thing that will sway me is being able to afford a MacBook Pro. Again, I love this thing!! Ps. I am 51 years old and I feel like a kid again with this PC.